Heart failure with preserved ejection (HFpEF) accounts for over 50 % of all HF cases, and the proportion is higher among women and older individuals. A hallmark feature of HFpEF is dyspnoea on exertion and reduced peak aerobic power (VO2peak) secondary to central and peripheral abnormalities that result in reduced oxygen delivery to and/or utilisation by exercising skeletal muscle. The purpose of this brief review is to discuss the role of exercise training to improve VO2peak and the central and peripheral adaptations that reduce symptoms following physical conditioning in patients with HFpEF. DWK is funded by NIH grants R01AG18915; P30AG12232. MJH is funded by the Moritz Chair in Geriatrics in the College of Nursing and Health Innovation at the University of Texas at Arlington. The remaining authors have no conflicts of interest to declare. Prior studies have demonstrated that exercise training is a safe and effective therapy to improve VO2peak, cardiovascular and skeletal muscle function, quality of life and hospital readmission rates in patients with HFrEF.14–24 Furthermore, exercise-based cardiac rehabilitation has been shown to modestly reduce both all-cause and cardiovascular mortality rates in HFrEF.19 As a result, in the US example, exercisebased cardiac rehabilitation is covered by Medicare in patients with HFrEF. In contrast, despite numerous studies showing that exercise training is a safe and effective therapy for improving exercise tolerance and quality of life in HFpEF,25–28 exercise-based cardiac rehabilitation is currently not covered by Medicare in patients with HFpEF due to limited data on its effect on survival in this population. In this brief review, we discuss the role of exercise training to improve VO2peak and the central and peripheral adaptations that occur with physical conditioning in patients with HFpEF. 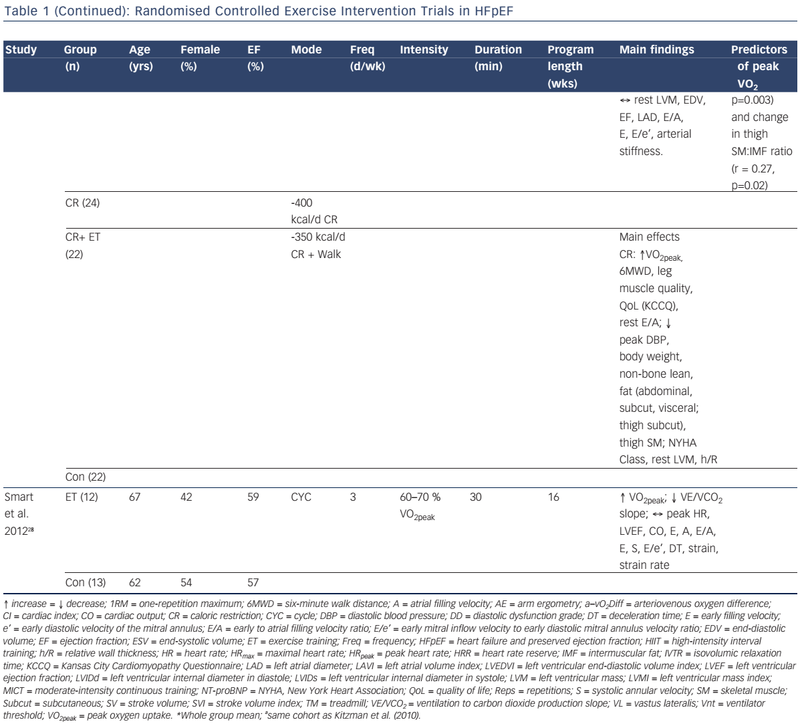 To date, eight randomised controlled trials have examined the efficacy of exercise training to improve VO2peak in patients with HFpEF (see Table 1).25–32 Specifically, in five of these studies, moderate-intensity continuous endurance training (MICT) was performed 3–5 days per week for 1–5 months. This exercise prescription is in line with the American Heart Association exercise guidelines for overall cardiovascular health, which recommends at least 30 minutes of moderate-intensity aerobic physical activity (such as walking) at least 5 days per week.33 Two studies incorporated high-intensity interval training (HIIT), consisting of 4–5 intervals performed at 80–95 % peak heart rate for 2–4 minutes interspersed with 2–3 minutes of active recovery, for 1–3 months. Finally, Alves et al.29 estimated VO2peak after 6 months of moderate intensity interval training (five 3-min sets of moderate-intensity [70–75 % maximal heart rate] treadmill walking or cycling interspersed with 1-min low-intensity active recovery) in patients with HFpEF. As shown in Figure 1, the increase in VO2peak after training is 2.2 ml/kg/min (~15 %), which is above the clinically meaningful change (1 ml/kg/min or 10 %) in VO2peak for patients with HF.34 The mechanisms responsible for the increased VO2peak may be due to cardiovascular or skeletal muscle adaptations that result in increased oxygen delivery and/or utilisation by the active muscles. Currently, only two studies have compared exercise cardiac function before and after exercise training in patients with HFpEF.26,37 Using 2D echocardiography, Haykowsky et al. measured rest, peak and reserve (peak minus rest) LV volumes and cardiac output and estimated arterial– venous oxygen difference (a–vO2Diff) before and after 16 weeks of MICT in older patients with HFpEF.37 The training-mediated increase in VO2peak was secondary to a significant increase in peak and reserve heart rate and a–vO2Diff with no change in peak or reserve end-diastolic volume, end-systolic volume, stroke volume or cardiac output. Several investigators have examined the vascular effects of endurance exercise training in older patients with HFpEF. 30–32 Kitzman et al. first reported that carotid arterial stiffness and brachial artery flow-mediated dilation (FMD) were not significantly different after 8 or 16 weeks of MICT.32 More recently, Kitzman et al. found that 20 weeks of MICT did not change carotid–femoral pulse wave velocity (i.e. vascular stiffness).31 Angadi et al. 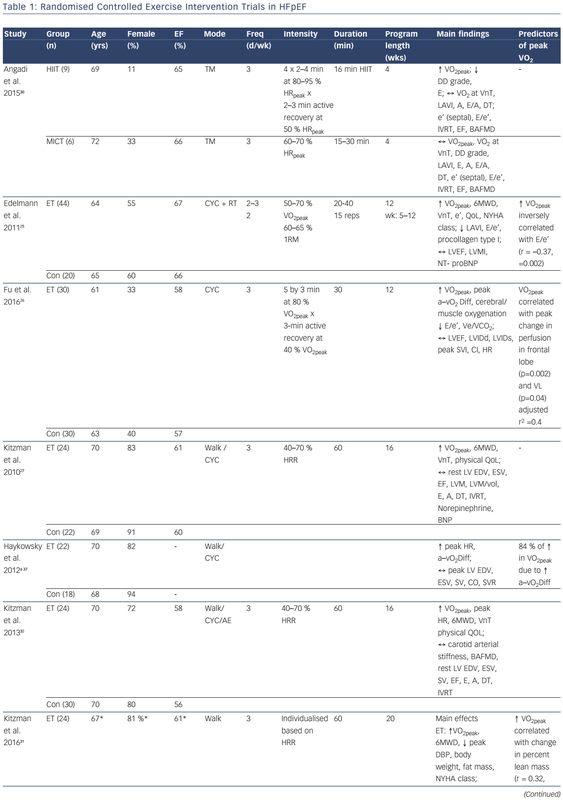 confirmed and extended these findings by showing that brachial artery FMD was unchanged after 4 weeks of MICT or HIIT in older patients with HFpEF (see Table 1).30 Taken together, the few studies performed to date suggest that the benefits of MICT or HIIT likely derive from mechanisms other than alterations in central or peripheral vascular function in clinically stable patients with HFpEF (see Table 1). Future studies are required to examine the change in microvascular function following exercise training in HFpEF. Angadi and colleagues were the first to compare MICT versus HIIT on peak VO2 in older patients with HFpEF.30 The main finding was that HIIT resulted in a significant increase in peak VO2 (pre: 19.2 versus 21.0 ml/kg/min; p=0.04) with no change after MICT (pre: 16.9 versus 16.8 ml/kg/min; p=0.93).30 Fu et al. measured peak VO2 and its determinants after 12 weeks of HIIT in patients with HFpEF and HFrEF.26 Peak VO2 was significantly higher after HIIT; however, the mechanisms of improvement were dependent on underlying HF phenotype.26 Specifically, peak exercise heart rate, stroke volume index and cardiac index increased significantly with no change in peak a–vO2Diff in patients with HFrEF. Conversely, the increased VO2peak in patients with HFpEF was secondary to the increase in peak a–vO2Diff. Accordingly, the mechanisms responsible for the improvement in VO2peak may differ between patients with HFrEF and HFpEF. Fukuta et al. 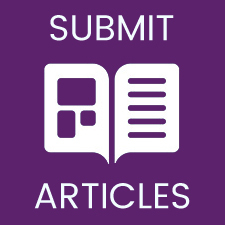 recently conducted a meta-analysis of randomised controlled trials on the effect of cardiovascular drugs (eight studies, 1080 patients) or exercise training (five studies, 245 patients) intervention on VO2peak, six-minute walk distance (6MWD) and quality of life (measured with the Minnesota Living with Heart Failure Questionnaire [MLHFQ] total score) in patients with HFpEF.50 The training mode included aerobic exercise (walking, cycling, 20–60 minutes per session, 2–3 days/week) for 12–24 weeks (a substantial portion of participants in the exercise intervention trials were receiving standard HF medications). Cardiovascular drug interventions included angiotensin-converting enzyme inhibitors, angiotensin receptor blockers, aldosterone antagonists or betablocker treatment (intervention duration ranged across trials between 14 and 52 weeks). The main finding was that exercise training improved VO2peak (weighted mean difference [WMD] of 2.3 ml/kg/min, 95 % confidence interval (CI) [1.3–3.2]), 6MWD (WMD of 30 min, 95 % CI [4.3–56.0]) and MLHFQ (8.9 points, 95 % CI [3.3–14.0]) compared with usual care. In contrast, cardiovascular drug intervention did not improve VO2peak, 6MWD or MLHFQ compared with placebo or no-treatment. More recent studies have examined the role of exercise training alone or combined with novel non-pharmacological therapy to improve exercise outcomes in patients with HFpEF. Kitzman et al. recently compared the effects of 20 weeks of CR or endurance training alone, or in combination, on VO2peak and quality of life in older obese patients with HFpEF (see Table 1).31 Endurance exercise training (+1.2 ml/kg/min VO2) and CR (+1.3 ml/kg/min VO2) significantly increased VO2peak and 6MWD, while the change in VO2peak with combined endurance training and CR were additive (+2.5 ml/kg/min). Both exercise training and CR also reduced body weight and fat mass, while CR improved leg muscle quality and decreased abdominal and thigh subcutaneous fat. Finally, the change in VO2peak was positively correlated with the change in percent lean mass and the change in thigh muscle to intermuscular fat ratio. Further studies are needed to determine whether these favourable changes in body composition are associated with reduced clinical events in patients with HFpEF. Zamani et al. performed a randomised, double-blind crossover study comparing a single dose of inorganic nitrate (12.9 mmol beetroot juice) with an identical nitrate-depleted placebo in 17 patients with HFpEF. 62 Beetroot juice increased VO2peak, total work performed and peak exercise cardiac output and reduced aortic augmentation index and systemic vascular resistance. Eggebeen et al. recently extended these findings by showing that 1 week of daily dosing with beetroot juice significantly improved submaximal aerobic endurance by 24 % and decreased resting blood pressure in older patients with HFpEF.59 These findings suggest that acute and short-term delivery of dietary inorganic nitrate can increase VO2peak and submaximal aerobic endurance in patients with HFpEF. Future, large-scale clinical trials are needed to determine whether dietary inorganic nitrate alone or combined with MICT or HIIT improve VO2peak and its determinants. A special mention should be made of a recent observational study by Pathak et al. that demonstrated the efficacy of exercise training in obese patients with atrial fibrillation (AF; LV ejection fraction >40 %, mean average across groups E/E’ ratio = 12.1 and left atrial volume index = 39 ml/m2).65 Although patients with HFpEF were not independently identified in this study, the description of the cohort suggests that many patients likely met criteria for HFpEF. Among patients with obesity and AF, HFpEF is disproportionately represented, as are overlapping risk factors such as hypertension and diabetes (observed in ~75 % and ~25 % of the study cohort, respectively). It is also notable that approximately three-quarters of the cohort had an exercise capacity below expected norms and other measures of diastolic function were frequently abnormal. Thus, it may be reasonable to consider this study cohort under a broad umbrella of HFpEF. Pathak et al. employed a novel intervention that included a tailored exercise programme that incorporated a combination of aerobic and strength exercises (increasing ≥200 min of exercise per week) as part of a dedicated physician-led risk factor management clinic that aggressively treated hypertension, hyperglycaemia, dyslipidaemia, obstructive sleep apnoea and obesity.65 A favourable response to exercise training was defined as an increase in maximal exercise capacity of more than two metabolic equivalent of tasks (approximating >20 % improvement) and this was achieved in 127 of the 308 subjects (41 %). This impressive intervention was associated with multiple health benefits including a marked reduction in AF, an improvement in diastolic measures and a reduction in left atrial size. In the absence of clear evidence as to which component of the lifestyle and risk factor intervention was most crucial, this key study reinforces the importance of taking a holistic view to cardiovascular health in addition to exercise training in patients with HFpEF or related risk factors. Patients with HFpEF have severe exercise intolerance secondary to impaired cardiovascular and skeletal muscle function. The few randomised controlled exercise intervention trials performed to date demonstrate that endurance training alone or combined with resistance training is an effective therapy to increase VO2peak secondary to peripheral ‘non-cardiac’ factors that result in increased oxygen extraction by the active muscles. Unlike HFrEF, the mean change in VO2peak with HIIT (2.2 ml/kg/min) is similar to that found after MICT (1.9 ml/kg/min). Finally, exercise training combined with novel non-pharmacological interventions (CR or acute or 1 week of beetroot juice) has also been shown to improve VO2peak and aerobic endurance in patients with HFpEF, while broad-based risk factor interventions may enhance the benefits of exercise. Mozaffarian D, Benjamin EJ, Go AS, et al. Heart disease and stroke statistics--2016 Update: A report from the American Heart Association. Circulation 2016; 133:e38–360. Heidenreich PA, Albert NM, Allen LA, et al. Forecasting the impact of heart failure in the United States: a policy statement from the American Heart Association. Circ Heart Fail 2013;6:606–19. Borlaug BA. The pathophysiology of heart failure with preserved ejection fraction. Nat Rev Cardiol 2014;11 :507–15. Sharma K, Kass DA. Heart failure with preserved ejection fraction: mechanisms, clinical features, and therapies. Circ Res 2015;115:79–96. Borlaug BA, Melenovsky V, Russell SD, et al. Impaired chronotropic and vasodilator reserves limit exercise capacity in patients with heart failure and a preserved ejection fraction. Circulation 2006;114:2138–47. Borlaug BA, Olson TP, Lam CS, et al. Global cardiovascular reserve dysfunction in heart failure with preserved ejection fraction. J Am Coll Cardiol 2010;56:845–54. Haykowsky MJ, Brubaker PH, John JM, et al. Determinants of exercise intolerance in elderly heart failure patients with preserved ejection fraction. J Am Coll Cardiol 2011;58:265–74. Kitzman DW, Higginbotham MB, Cobb FR, et al. Exercise intolerance in patients with heart failure and preserved left ventricular systolic function: failure of the Frank-Starling mechanism. J Am Coll Cardiol 1991;17:1065–72 . Haykowsky MJ, Tomczak CR, Scott JM, et al. Determinants of exercise intolerance in patients with heart failure and reduced or preserved ejection fraction. J Appl Physiol (1985) 2015;119:739–44. Haykowsky MJ, Kitzman DW. Exercise physiology in heart failure and preserved ejection fraction. Heart Fail Clin 2014;10:445–52. Sarma S, Levine BD. Soothing the sleeping giant: improving skeletal muscle oxygen kinetics and exercise intolerance in HFpEF. J Appl Physiol (1985) 2015;119:734–8. Upadhya B, Haykowsky MJ, Eggebeen J, et al. Exercise intolerance in heart failure with preserved ejection fraction: more than a heart problem. J Geriatr Cardiol 2015;12:294–304. Kato T, Nakane E, Funasako M, et al. A potential linkage between mitochondrial function of the heart and leg muscles in patients with heart failure. Int J Cardiol 2015;188:67–9. Coats AJ, Adamopoulos S, Radaelli A, et al. Controlled trial of physical training in chronic heart failure. Exercise performance, hemodynamics, ventilation, and autonomic function. Circulation 1992;85:2119–31. Hambrecht R, Fiehn E, Weigl C, et al. Regular physical exercise corrects endothelial dysfunction and improves exercise capacity in patients with chronic heart failure. Circulation 1998;98:2709–15. Hambrecht R, Fiehn E, Yu J, et al. Effects of endurance training on mitochondrial ultrastructure and fiber type distribution in skeletal muscle of patients with stable chronic heart failure. J Am Coll Cardiol 1997;29:1067–73. Hambrecht R, Gielen S, Linke A, et al. Effects of exercise training on left ventricular function and peripheral resistance in patients with chronic heart failure: A randomized trial. JAMA 2000;283:3095–101. Hambrecht R, Niebauer J, Fiehn E, et al. Physical training in patients with stable chronic heart failure: effects on cardiorespiratory fitness and ultrastructural abnormalities of leg muscles. J Am Coll Cardiol 1995;25:1239–49. O’Connor CM, Whellan DJ, Lee KL, et al. Efficacy and safety of exercise training in patients with chronic heart failure: HF-ACTION randomized controlled trial. JAMA 2009;301:1439–50. Pu CT, Johnson MT, Forman DE, et al. Randomized trial of progressive resistance training to counteract the myopathy of chronic heart failure. J Appl Physiol (1985) 2001;90:2341–50. Sullivan MJ, Cobb FR. The anaerobic threshold in chronic heart failure. Relation to blood lactate, ventilatory basis, reproducibility, and response to exercise training. Circulation 1990;81 (1 Suppl):II47–58. Sullivan MJ, Higginbotham MB, Cobb FR. Exercise training in patients with severe left ventricular dysfunction. Hemodynamic and metabolic effects. Circulation 1988;78: 506–15. Sullivan MJ, Higginbotham MB, Cobb FR. Exercise training in patients with chronic heart failure delays ventilatory anaerobic threshold and improves submaximal exercise performance. Circulation 1989;79:324–9. Taylor RS, Sagar VA, Davies EJ, et al. Exercise-based rehabilitation for heart failure. Cochrane Database Syst Rev 2014:CD003331. Edelmann F, Gelbrich G, Dungen HD, et al. 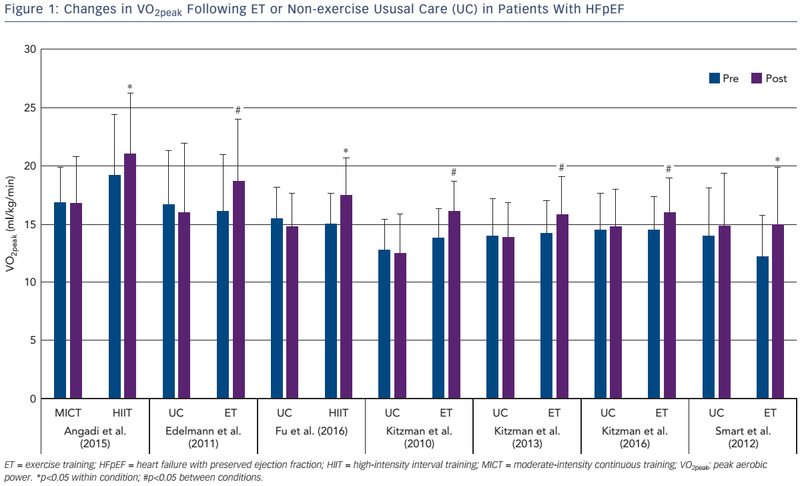 Exercise training improves exercise capacity and diastolic function in patients with heart failure with preserved ejection fraction: results of the Ex-DHF (Exercise training in Diastolic Heart Failure) pilot study. J Am Coll Cardiol 2011;58:1780–91. Fu TC, Yang NI, Wang CH, et al. Aerobic interval training elicits different hemodynamic adaptations between heart failure patients with preserved and reduced ejection fraction. Am J Phys Med Rehabil 2016;95:15–27. Kitzman DW, Brubaker PH, Morgan TM, et al. Exercise training in older patients with heart failure and preserved ejection fraction: a randomized, controlled, single blind trial. Circ Heart Fail 2010;3:659–67. Smart NA, Haluska B, Jeffriess L, et al. Exercise training in heart failure with preserved systolic function: a randomized controlled trial of the effects on cardiac function and functional capacity. Congest Heart Fail 2012;18:295–301. Alves AJ, Ribeiro F, Goldhammer E, et al. Exercise training improves diastolic function in heart failure patients. Med Sci Sports Exerc 2012;44:776–85. Angadi SS, Mookadam F, Lee CD, et al. High-intensity interval training vs. moderate-intensity continuous exercise training in heart failure with preserved ejection fraction: a pilot study. J Appl Physiol (1985) 2015;119:753–8. Kitzman DW, Brubaker P, Morgan T, et al. Effect of caloric restriction or aerobic exercise training on peak oxygen consumption and quality of life in obese older patients with heart failure with preserved ejection fraction: a randomized clinical trial. JAMA 2016;315:36–46. Kitzman DW, Brubaker PH, Herrington DM, et al. Effect of endurance exercise training on endothelial function and arterial stiffness in older patients with heart failure and preserved ejection fraction: a randomized, controlled, single blind trial. J Am Coll Cardiol 2013;62:584–92. Haskell WL, Lee IM, Pate RR, et al. Physical activity and public health: updated recommendation for adults from the American College of Sports Medicine and the American Heart Association. Circulation 2007;116:1081–93. Kitzman DW. Exercise training in heart failure with preserved ejection fraction: beyond proof-of-concept. J Am Coll Cardiol 2011;58:1792–4. Abudiab MM, Redfield MM, Melenovsky V, et al. Cardiac output response to exercise in relation to metabolic demand in heart failure with preserved ejection fraction. Eur J Heart Fail 2013;15:776–85. Fujimoto N, Prasad A, Hastings JL, et al. Cardiovascular effects of 1 year of progressive endurance exercise training in patients with heart failure with preserved ejection fraction. Am Heart J 2012;164:869–77. Haykowsky MJ, Brubaker PH, Stewart KP, et al. Effect of endurance training on the determinants of peak exercise oxygen consumption in elderly patients with stable compensated heart failure and preserved ejection fraction. J Am Coll Cardiol 2012;60:120–8. Hundley WG, Kitzman DW, Morgan TM, et al. Cardiac cycle dependent changes in aortic area and distensibility are reduced in older patients with isolated diastolic heart failure and correlate with exercise intolerance. J Am Coll Cardiol 2001;38:796–802. Kitzman DW, Herrington DM, Brubaker PH, et al. Carotid arterial stiffness and its relationship to exercise intolerance in older patients with heart failure and preserved ejection fraction. Hypertension 2013;61 :112–9. Balmain S, Padmanabhan N, Ferrell WR, et al. Differences in arterial compliance, microvascular function and venous capacitance between patients with heart failure and either preserved or reduced left ventricular systolic function. Eur J Heart Fail 2007;9:865–71. Lee JF, Barrett-O’Keefe Z, Garten RS, et al. Evidence of microvascular dysfunction in heart failure with preserved ejection fraction. Heart 2016;102: 278–84. Kitzman DW, Haykowsky MJ. Vascular dysfunction in heart failure with preserved ejection fraction. J Card Fail 2016;22: 12–6. Lee JF, Barrett-O’Keefe Z, Nelson AD, et al. Impaired skeletal muscle vasodilation during exercise in heart failure with preserved ejection fraction. Int J Cardiol 2016;211 :14-21. Haykowsky MJ, Brubaker PH, Morgan TM, et al. Impaired aerobic capacity and physical functional performance in older heart failure patients with preserved ejection fraction: role of lean body mass. J Gerontol A Biol Sci Med Sci 2013;68:968–75. Kitzman DW, Nicklas B, Kraus WE, et al. Skeletal muscle abnormalities and exercise intolerance in older patients with heart failure and preserved ejection fraction. Am J Physiol Heart Circ Physiol 2014;306:H1364–70. Bhella PS, Prasad A, Heinicke K, et al. Abnormal haemodynamic response to exercise in heart failure with preserved ejection fraction. Eur J Heart Fail 2011;13:1296–304. Fleg JL, Cooper LS, Borlaug BA, et al. Exercise training as therapy for heart failure: current status and future directions. Circ Heart Fail 2015;8:209–20. Haykowsky MJ, Timmons MP, Kruger C, et al. Meta-analysis of aerobic interval training on exercise capacity and systolic function in patients with heart failure and reduced ejection fractions. Am J Cardiol 2013;111 :1466–9. Suchy C, Massen L, Rognmo O, et al. Optimising exercise training in prevention and treatment of diastolic heart failure (OptimEx-CLIN): rationale and design of a prospective, randomised, controlled trial. Eur J Prev Cardiol 2014;21 (2 Suppl):18–25. Fukuta H, Goto T, Wakami K, et al. Effects of drug and exercise intervention on functional capacity and quality of life in heart failure with preserved ejection fraction: A metaanalysis of randomized controlled trials. Eur J Prev Cardiol 2016;23:78–85. de las Fuentes L, Waggoner AD, Mohammed BS, et al. Effect of moderate diet-induced weight loss and weight regain on cardiovascular structure and function. J Am Coll Cardiol 2009;54:2376–81. Haufe S, Utz W, Engeli S, et al. Left ventricular mass and function with reduced-fat or reducedcarbohydrate hypocaloric diets in overweight and obese subjects. Hypertension 2012;59:70–5. Beavers KM, Miller ME, Rejeski WJ, et al. Fat mass loss predicts gain in physical function with intentional weight loss in older adults. J Gerontol A Biol Sci Med Sci 2014;68:80–6. Normandin E, Houston DK, Nicklas BJ. Caloric restriction for treatment of geriatric obesity: Do the benefits outweigh the risks? Curr Nutr Rep 2015;4:143–55. Prior SJ, Blumenthal JB, Katzel LI, et al. Increased skeletal muscle capillarization after aerobic exercise training and weight loss improves insulin sensitivity in adults with IGT. Diabetes Care 2014;37:1469–75. Villareal DT, Chode S, Parimi N, et al. Weight loss, exercise, or both and physical function in obese older adults. N Engl J Med 2011;364:1218–29. Haass M, Kitzman DW, Anand IS, et al. Body mass index and adverse cardiovascular outcomes in heart failure patients with preserved ejection fraction: results from the Irbesartan in Heart Failure with Preserved Ejection Fraction (I-PRESERVE) trial. Circ Heart Fail 2011;4:324–31. Yancy CW, Jessup M, Bozkurt B, et al. 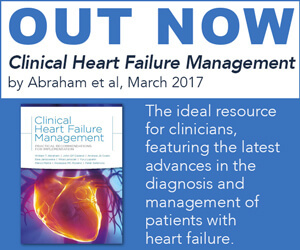 2013 ACCF/AHA guideline for the management of heart failure: a report of the American College of Cardiology Foundation/American Heart Association Task Force on Practice Guidelines. J Am Coll Cardiol 2013;62:e147–239..
Eggebeen J, Kim-Shapiro DB, Haykowsky M, et al. One week of daily dosing with beetroot juice improves submaximal endurance and blood pressure in older patients with heart failure and preserved ejection fraction. JACC Heart Fail 2016;4:428–37. Kapil V, Khambata RS, Robertson A, et al. Dietary nitrate provides sustained blood pressure lowering in hypertensive patients: a randomized, phase 2, double-blind, placebocontrolled study. Hypertension 2015;65:320–7. Kapil V, Weitzberg E, Lundberg JO, et al. Clinical evidence demonstrating the utility of inorganic nitrate in cardiovascular health. Nitric Oxide 2014;38:45–57. Zamani P, Rawat D, Shiva-Kumar P, et al. Effect of inorganic nitrate on exercise capacity in heart failure with preserved ejection fraction. Circulation 2015;131 : 371–80. Bailey SJ, Winyard P, Vanhatalo A, et al. Dietary nitrate supplementation reduces the O2 cost of low-intensity exercise and enhances tolerance to high-intensity exercise in humans. J Appl Physiol (1985) 2009;107:1144–55. Larsen FJ, Weitzberg E, Lundberg JO, et al. Effects of dietary nitrate on oxygen cost during exercise. Acta Physiol (Oxf) 2007;191 :59–66. Pathak RK, Elliott A, Middeldorp ME, et al. Impact of CARDIOrespiratory FITness on Arrhythmia Recurrence in Obese Individuals with Atrial Fibrillation: The CARDIO-FIT Study. J Am Coll Cardiol 2015;66:985–96.